king lot has five of them including our own). 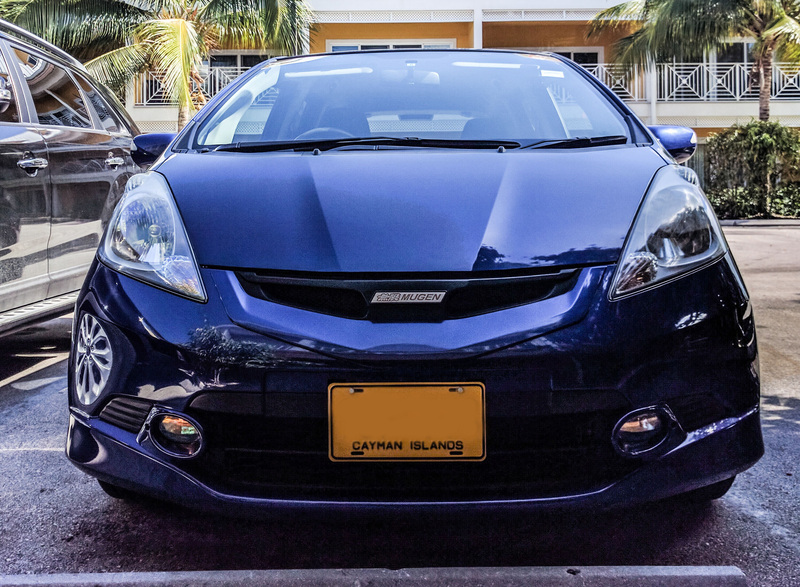 Our Fit is slick lines, is a cool Aegean Blue, HID headlights, and a Mugen 無限 front grill. At this point in life, that front grill is the closest I’ll probably come to the flashy drool-worthy JDM import tuner dreams of my youth. Fit is distinctly Japanese. On the inside of the windscreen are stickers indicating when the last car inspection was, and when the registration expires. Whenever we put the keys in the ignition the car beeps and a polite female voice greets us, speaking in Japanese. We don’t know what she’s saying to us. One morning on the way to work, the polite lady started counting down. “That’s 3! That’s 2!” I call out. I think I remember how to count to ten in Japanese. “That’s three again?” Morning traffic and a beeping countdown add to the general stress of the beginning of day commute. The car is anxious to get to the end of the countdown, but never quite makes it to zero (as near as we can tell). But it’s not the countdown, or the greetings, or the Japanese stickers that make me think that our car is homesick. It’s the home it’s looking for in its audio/navigation system. One night while driving to Dan and Olga’s place in West Bay, the car catches the scent of something in the air, an electromagnetic global pulse through the atmosphere and suddenly the navigation screen flickers on, overriding the default iPod player screen. A map appears with an unknown route. The car immediately tries to navigate us somewhere, the Japanese voice urges to make turns that don’t exist, then kindly recalibrates its route when we miss them. As we drive we watch the map. The navigation takes us through imaginary urbane areas, passing shopping centers and gas stations when outside of our window are jungled forests, coastal palm trees. We drive on bridges over ghost rivers where water never flowed. After we make it back to our apartment I spend another thirty minutes in the car trying to figure out the navigation menu. When we bought the car the salesman warned us that the audio system was in Japanese. I didn’t worry too much about it. I knew that Japanese occasionally used Chinese Characters and I was confident that I knew enough Chinese that I could parse out the meaning of the settings and menus. I knew the word for “setting” (设定) but everything preceding the word setting is in Japanese characters that I can’t read. Everything is a ******* setting, and the kanji is no help. So I sit in the dark of the car staring at menus that I can only guess to the meaning. I randomly push buttons in the menu and the voice asks a question. A smiling picture of a cartoon woman in a grey business suit holds out a microphone and waits for an answer. When I don’t answer, she politely asks again, holding the microphone expectantly. I sheepishly push another button to get out of this menu. The next button I push brings up the words “now searching” in Chinese. Great, what is she searching for? The late night radio plays Massenet’s Meditations. It’s an incredibly beautiful but melancholy piece. There’s a button of with a picture of a house in the navigation menu. I push it and the menu takes me to a map. An arrow indicates where it thinks we are, and it’s destination marked with a checkered flag. I zoom out on the map and sure enough, the car thinks that it’s somewhere in the Tokyo area. The screen shows a distance of 271 KM and an estimated travel time of 3 hours and 25 minutes. I just told the car to go home, and it’s trying to do it, I realize. Never mind that home is two oceans away in another country, 12,524 KM from here. I know that when the car starts moving, it will start giving us directions, prompts to turn that we don’t understand, prompts that we can never follow. The other thing I know is that no matter how hard the car tries to guide us to its home in Japan, the roads on the Cayman Islands will never lead the car back to Japan. Traveling by map like in the movies is not an option here. When I go in Natalie asks what was wrong with the car. “The car wanted to go home,” I answer. “The car is home!” Natalie says, frowning. “Yeah but I don’t think it knows that,” I reply. Natalie gives me a pout, sad that our car doesn’t know it’s home. There are a lot of Honda Fits on the island. I imagine that if this world we lived in were like the Pixar worlds of talking inanimate objects, our Fit would be able to reach out and talk to the Mystic Yellow, Milano Red, and Alabaster Silver Fits in our parking lot. When we aren’t around they share stories about their favorite driving routes, ramen shops, and the latest and greatest anime. They pine about their homeland and debate whether their days in the sun now are better than the ones they used to know, under neon and fluorescent street lights, surrounded by the crush of a million souls. (So if anyone that speaks Japanese wants to come and visit us, we have a car for you to decipher).